Today began with our usual breakfast of eggs, croissants, and fruit. Eggs were prepared in various styles: over-easy, sunny-side up, and scrambled. In the process, we found that our Nebraskan friend David von Behren uses slightly backwards terms for the first two: “easy-over” and “upside sunny.” This provoked an interesting, though drowsy, conversation about cultural differences between our hometowns. After breakfast, we headed to the Montparnasse train station, where we met Jean-Baptiste Robin, an expert in French Classical music and former organist at Cathédrale Saint-Pierre de Poitiers (Poitiers Cathedral). Our high-speed train was far smoother than any American train we had been on, and it got us to Poitiers in only two hours. Laura and Jordan on the train to Poitiers! Upon arriving in Poitiers, we picked up sandwiches at a small deli and ate them during our way to the Cathedral. As we walked, Jean-Baptiste pointed out landmarks along the way, including the place where Joan of Arc was last interrogated before her execution. He also told us that the famous Clicquot champagne was created by a member of the same Clicquot family as that of the builders of the Poitiers Cathedral organ! Jean-Baptiste shows us around Poitiers! The cathedral holds the famous 1791 Clicquot organ, which, remarkably, remains largely untouched; all of the pipework is original and only slight modifications and restorations have taken place. We entered through the back of the church; the western façade was incredibly ornate and its carved figures and rose window reminded us of Notre Dame in Paris. Meeting Olivier Houette, organist at Poitiers Cathedral! Inside, we met the current organist at Poitiers, Olivier Houette, who masterfully improvised on the instrument so we could listen to its blend from downstairs. The sound struck a fine balance between piercing the air and drawing the listener in, and the organ fit the space perfectly. In fact, one of the important lessons we’ve learned is that much of the magic of such fine French instruments depends on the tremendous and reverberant spaces in which they live. It is clear that such instruments would not be the same in smaller, drier rooms. 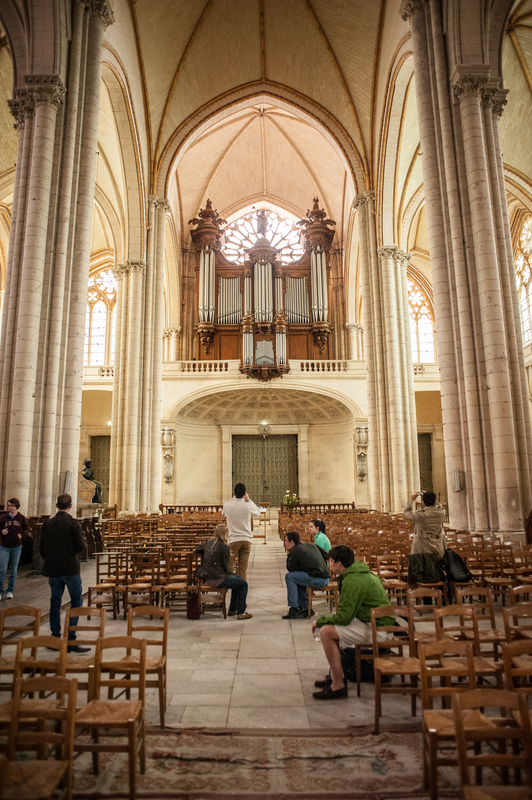 Thus, the large impact of acoustics in these churches has reminded us to listen and adapt our playing constantly to the actual sounds that result from our playing; it would be a huge mistake to use the same playing style on each organ that we visit. This becomes a difficult endeavor because usually the sound is quite different at the organ console than it is in the rest of the church, so we are sure to walk around the church while others are playing to get a sense of the acoustics. Karen plays Marchand’s Grand Dialogue during our masterclass with Jean-Baptiste Robin! During our extended masterclass with Jean-Baptiste, we were taught about the improvisatory nature of French Classical organ repertoire and the interpretive decisions that he demonstrated as he brought the music to life. Jean-Baptiste taught with a perfect blend of musicality, humility, and humor. It was an incredible experience to play this music on an instrument from the same time period; one could feel that the music made so much sense played on the Clicquot. It was like travelling back in time several centuries as we played the music of Couperin, Marchand, Daquin, and Nivers on the sort of instrument those composers lived with. After returning to Paris, we ate dinner at Au Chien Qui Fume (“The Smoking Dog”) and celebrated Adriana’s birthday! David’s passion for his dessert, Chocolate Mousse, was impressive, and he strongly considered asking the waiter for a tub of Mousse to bring home.